West Fest is produced by Boots Hughston (2b1 Multimedia) and the Council of Light in association with Woodstock co-creator Artie Kornfeld. The original Woodstock music festival may have taken place in New York, but the Summer of Love was alive and well across the country. In an unprecedented event, the counter culture decided that enough was enough. They redefined what it was to live among fellow human beings and came up with one word to describe it-Love. What began with counterculture icons such as Ken Keasey, Jack Kerouac, Allen Ginsberg, Lawrence Ferlinghetti, and the Beat Generation grew into communities all across the country. Anti-establishment communities began to surface and focus on art, poetry, music, and freedom. Soon the movement exploded and what was to become known as the Summer of Love, had begun. West Fest, set to be held in Golden Gate Park in San Francisco is a celebration of the 40th anniversary of Woodstock, and also the events that led to the manifestation of Woodstock. Those who see West Fest as a West coast version of what was primarily an East coast even that changed the world should reevaluate. Woodstock 1969 was indeed one of the counterculture events that helped change American culture and define an entire generation, but the Free Speech Movement, Free Love Movement, Farm Workers Movement, Women’s Movement, Gay Rights Movement, Sexual Revolution, and many other anti-establishment rallies had their roots in the San Francisco area. The free West Fest concert celebrates the achievements of the counterculture movement in the San Francisco area as well as the East coast efforts of flower children. What is now known as the Woodstock Nation has its roots buried all over the country. A generation that pushed the boundaries of authority and showed the world that they could live a peaceful existence with their fellow man is reuniting to send the same message this October. This October will be more than a celebration of the most historic event in the history of music, but an entire generation who had the courage to change the world. So much more than just a concert, Woodstock 1969 was an embodiment of half a million individuals united in one set of ideals gathering to share peace, love, and music. 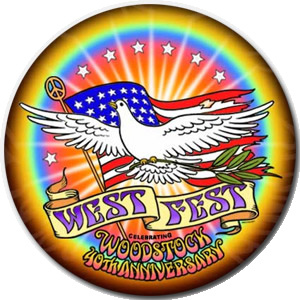 Join the Woodstock Nation in Golden Gate Par on October 25, 2009 for West Fest. Events will include Beat Generation poets, hundreds of San Francisco musicians, anti-war speakers, members of the Free Speech Movement, members of the Green Movement, and many other guests that capture the spirit of the Woodstock Nation. Drinkware will be supplied by the same company that supplied greenware cups and recycled towels for the Summer of Love’s 40th anniversary festival in GG Park two years ago. Celebrate the 40th anniversary of Woodstock 1969 as well as the San Francisco counterculture movement with West Fest, produced by 2b1 Multimedia Inc., the Council of Light, in association with Artie Kornfeld — co-producer of Woodstock ’69.